San Bernardino County Public Information Officer Cindy Bachman speaks at a press conference at the base of Bear Mountain Ski Resort on February 7. 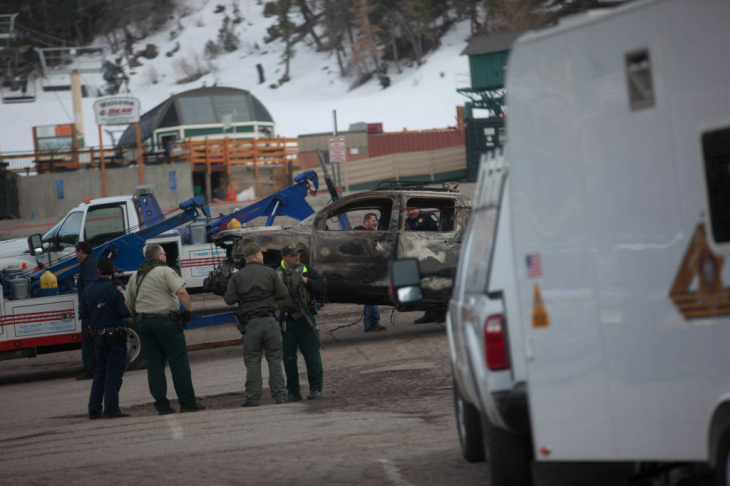 The truck belonging to Christopher Dorner is towed to a police command center at Bear Mountain Ski Resort. Police say Dorner burned the truck and a hunt for the suspect is ongoing. Law enforcement brief at the base of Bear Mountain ski resort, which has been closed all day, because of a massive manhunt for Christopher Dorner. 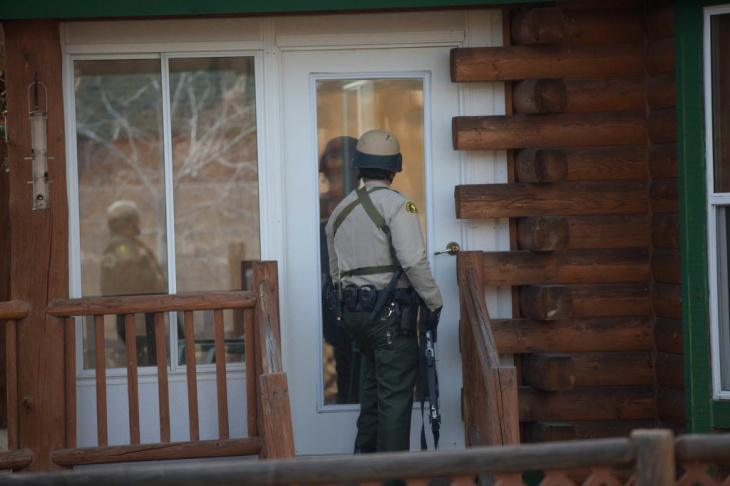 Law enforcement officials conduct a door-to-door search in Big Bear for Christopher Dorner. His truck was found burned in the area. 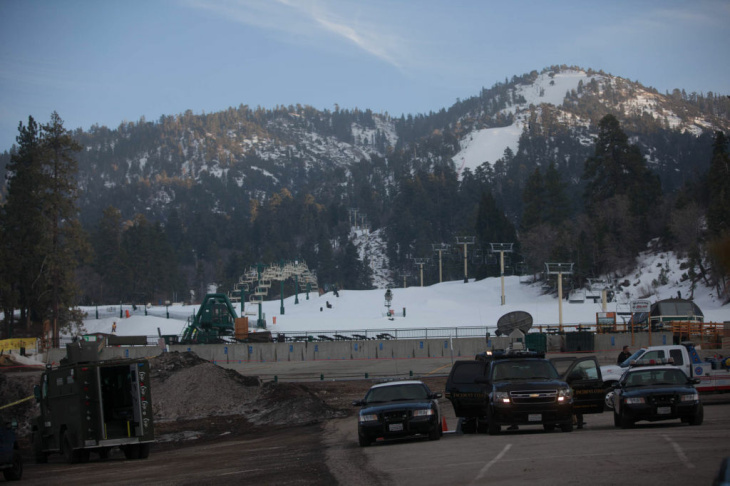 Law enforcement vehicles are parked at the base of Bear Mountain ski resort, which has been closed all day, because of a massive manhunt for Christopher Dorner. 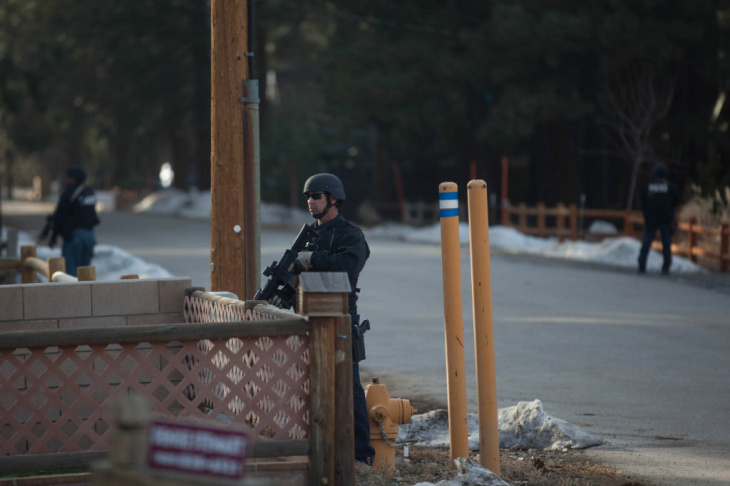 An officer walks toward a briefing at the base of Bear Mountain ski resort, which has been closed all day, because of a massive manhunt for Christopher Dorner. 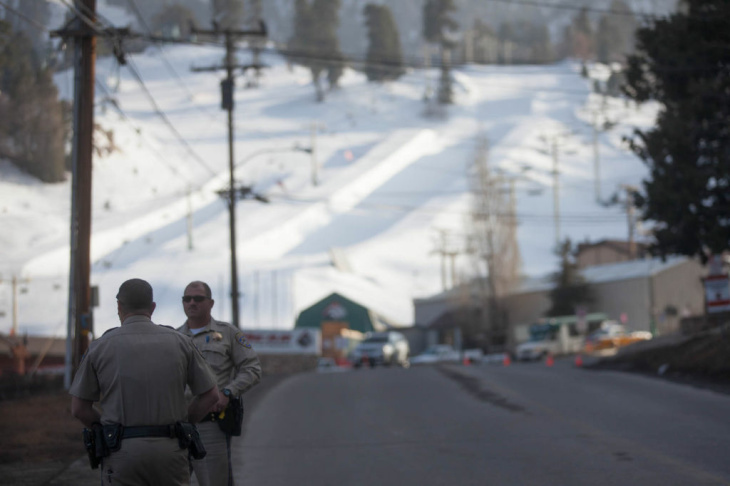 Sheriff's deputies guard the entrance to Bear Mountain Resort where law enforcment officials are conducting a widespread manhunt for Christopher Dorner. 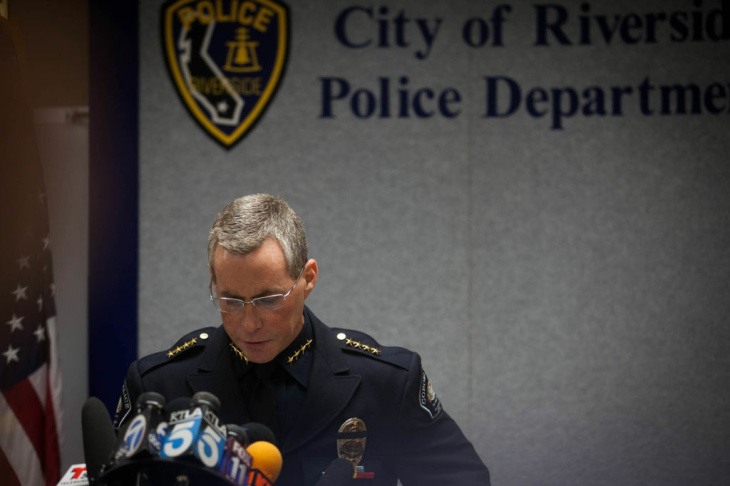 Police Chief Sergio Diaz speaks at a press conference in Riverside. Police are hunting for Christopher Dorner, suspected of multiple murders in Southern California. 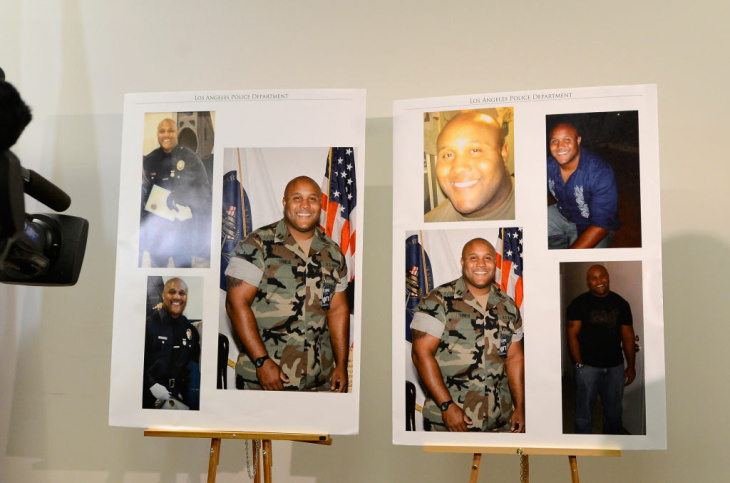 Pictures provided by Los Angeles Police Department of alleged suspect Christopher Dorner are displayed during briefing on February 7, 2013 in Los Angeles, California. A former Los Angeles police officer Christopher Jordan Dorner, 33, who had allegedly warned he would target law enforcement, is suspected three police officers killing one. Dorner is also a suspect in two weekend killings of Monica Quan and Keith Lawrence who were found dead in a car inside a parking structure. An LAPD officer walks on an I-15 overpass in Corona where police say Christopher Dorner shot at two officers. Police across the state are searching for Christopher Dorner in connection with a string of homicides. Police officers at the site of a shooting that left one officer dead overnight on February 7 near the 91 Freeway in Riverside. 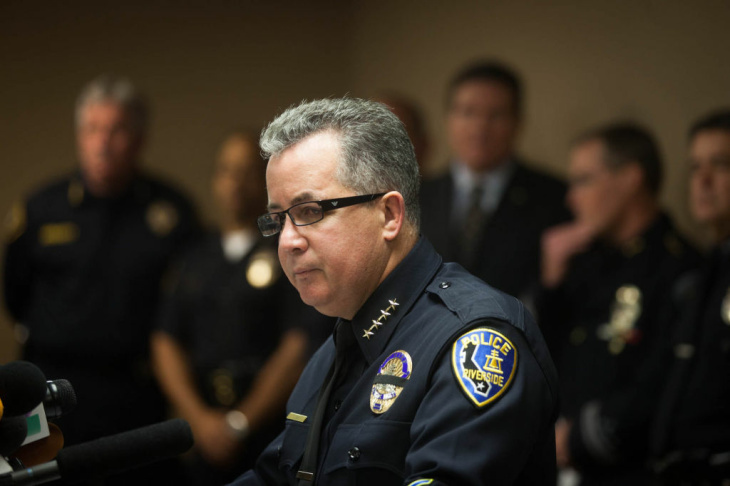 Corona Police Chief Michael Abel speaks at a press conference. One of a string of shootings that spawned an area-wide search for a suspect occurred on an I-15 overpass in Corona. 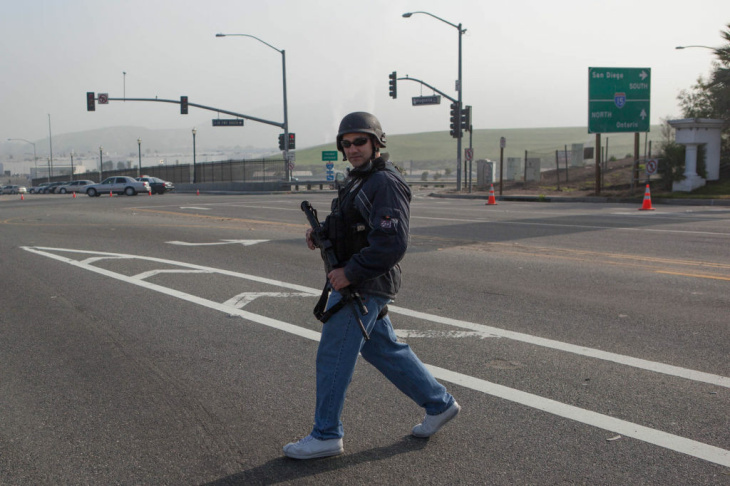 An LAPD officer guards a highway overpass where two officers were shot in what police describe as an ambush. Officers are searching for Christopher Dorner in connection with a string of homicides. A police officer waits at the site of a shooting that left one officer dead overnight on February 7 near the 91 Freeway in Riverside. 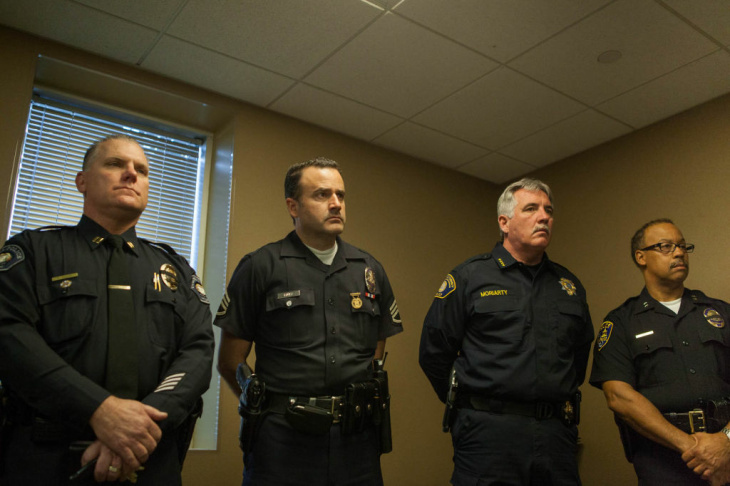 Members of the Riverside Police Department listen as officials speak at a press conference following a shooting in Riverside that left one officer dead and one injured. 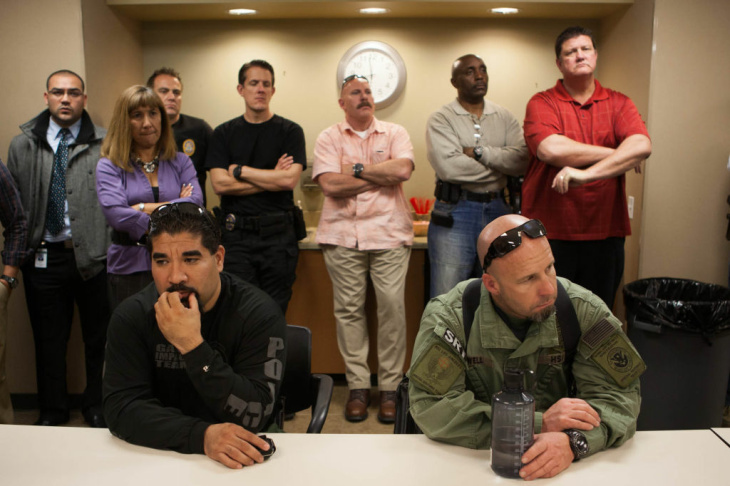 Law enforcement officials listen as officials speak at a press conference following a shooting in Riverside that left one officer dead and one injured. Update 9:18 p.m.: San Bernardino County sheriff's deputies and other law enforcement officers continued their search Thursday night for fugitive cop-killing suspect Christopher Dorner, but a canvass of more than half of an expected 400 homes in Big Bear had turned up no sign of the ex-LAPD officer as of 9 p.m. Speaking at a press briefing, San Bernardino County Sheriff's Department spokeswoman Cindy Bachman told reporters that schools in the Bear Valley Unified School District are expected to be in session Friday morning, and the local ski resort would reopen for business as well. 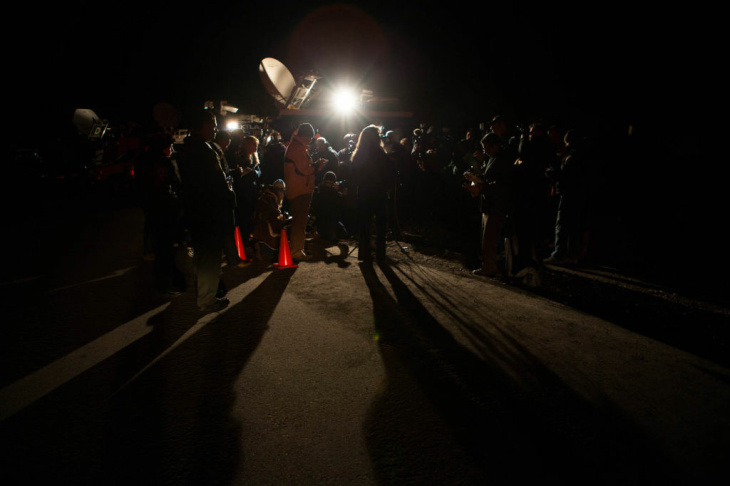 As temperatures dipped, darkness fell and a winter storm threatened, law enforcement officials planned to continue searching through the night, relying mainly on two San Bernardino County sheriff's helicopters and one L.A. County sheriff's helicopter, all outfitted with infrared thermal imaging equipment, Bachman said. Despite an extensive search of the area around the Bear Mountain ski resort, Bachman said she was not aware of any further foot tracks, signs of break ins at vacant vacation homes or indications of a second vehicle leaving the area where Dorner's burned-out truck was discovered on Thursday morning. That truck, meanwhile, had been taken to a sheriff's department lab for testing, Bachman said; she didn't know of the results of any tests yet. 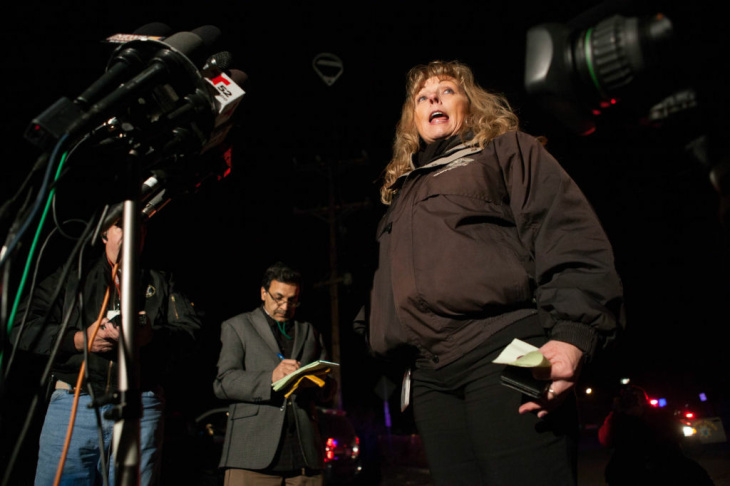 San Bernardino County Sheriff John McMahon planned to brief reporters again at 9 a.m. Friday. 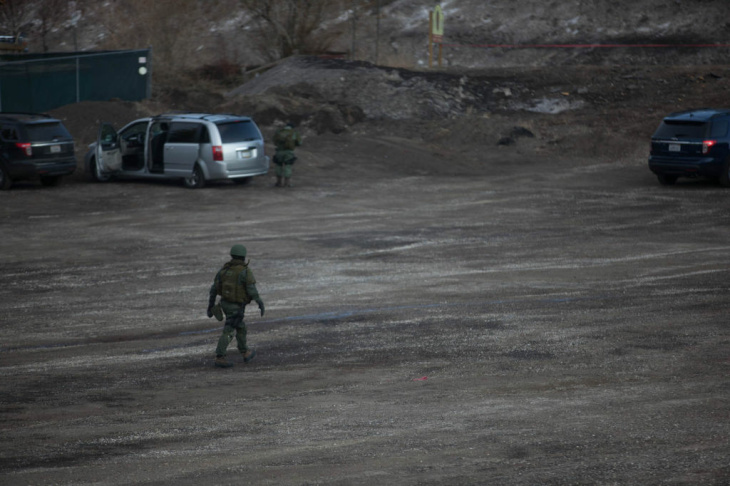 An extensive search for the suspect, Christopher Dorner, will continue throughout the night. Law Enforcement personnel from San Bernardino County Sheriff’s Department, Los Angeles Police Department, Riverside Police Department, Los Angeles County Sheriff’s Department, FBI, Irvine Police Department, Orange County Sheriff’s Department, Pomona Police Department, US Forest Service and CalFire will continue to search the forest area and go door-to-door in an effort to find Dorner. If the weather changes drastically during the night and hampers the search, then multiple two man units will be patrolling the area. Update 8:14 p.m.: As the hunt for Christopher Dorner continues with a focus on the San Bernardino Mountains, there’s a greater law enforcement presence across all of Southern California. Armed officers were on guard this evening at the 7th and Metro subway station in Downtown Los Angeles. Tighter security was also evident outside LAPD headquarters. Hours before Dorner’s truck was found in Big Bear, California Highway Patrol and Irvine Police vehicles were stationed at lookout points on either end of the 73 toll road in south Orange County. A few miles north of the 405 Freeway, a Huntington Beach Police patrol car parked along the northbound lanes, with officers inside watching and waiting in case Dorner drove past. Christopher Dorner was with the Los Angeles Police Department for three years, before he was fired in 2008, but then-chief Bill Bratton told CNN that he doesn’t remember Dorner’s disciplinary case. Bratton said that he typically went through as many as 400 major disciplinary cases a year. Riverside police, residents, and city officials gathered Thursday evening at Riverside City Hall to mourn the unidentified Riverside police officer allegedly gunned down by ex-LAPD officer Christopher Dorner, the California Report's Steven Cuevas reports. About 125 people gathered for the vigil, according to the Press-Enterprise’s Alicia Robinson. Several officers attended with black bands across their badges. Denise Henderson, who knew Officer Ryan Bonaminio, killed in 2010, said, “We’re horrified having another slain officer,” Robinson reports. Riverside police Chief Sergio Diaz slipped quietly through the crowd, stopping to accept a few long hugs. Dozens of law enforcement officers are moving through the San Bernardino Mountains Thursday evening, searching for the ex-LAPD officer that investigators say has killed three people since last weekend. 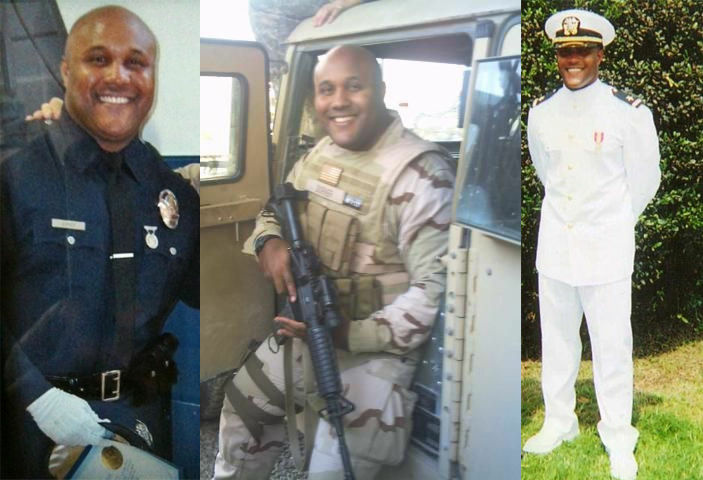 Christopher Dorner may be targeting a group of current and former LAPD officers who were involved in his dismissal. Complicating that effort is a storm front that could bring snow to the Big Bear area Thursday night. In a 5:30 p.m. news conference, Sheriff John McMahon said that authorities will continue the search as long as they can — weather permitting. McMahon said that the weather doesn’t affect the dogs that are searching for Dorner. McMahon said that authorities followed tracks that were found earlier, but they didn’t lead to the suspect. He added that they didn’t lead to a residential area either. McMahon said that 125 law enforcement officers were combing the area around Big Bear Lake for Dorner as a snowstorm approached and a three-state manhunt increasingly centered on the rural mountain community. She says deputies are now on a house-to-house search for Dorner. Randy Linville, a property manager of vacation homes in the upscale neighborhood at the base of the Bear Mountain ski resort, first noticed the fire from Dorner's truck about 11 a.m. above a golf course northwest of the ski resort. "At first, I thought it was a controlled burn," he told KPCC. "So I didn't pay a lot of attention. ... And then I got text messages from friends mentioning that they think he's in Big Bear." Linville said that since authorities found the truck, they have closed the ski resort, cordoned off the area and set up a command post nearby. "A lot of guys with assault weapons, military style gear, the helmets, the whole deal," he said. Linville added that there are miles of foot trails around the back of the ski resort higher in the mountains off the fire road where he believes Dorner took his truck. "I’d say 15 to 20 miles long. And then it has a handful of areas where it peels off," he said. "And then once you get out there, I mean there’s foot trails – miles and miles of foot trails – that drop down the backside of the mountain." Hiking out would be treacherous as a cold front is rolling over the San Bernardino Mountains, and the snow level could drop as low as three thousand feet. San Bernardino County deputies found the burned-out shell of Christopher Dorner’s truck near Big Bear. 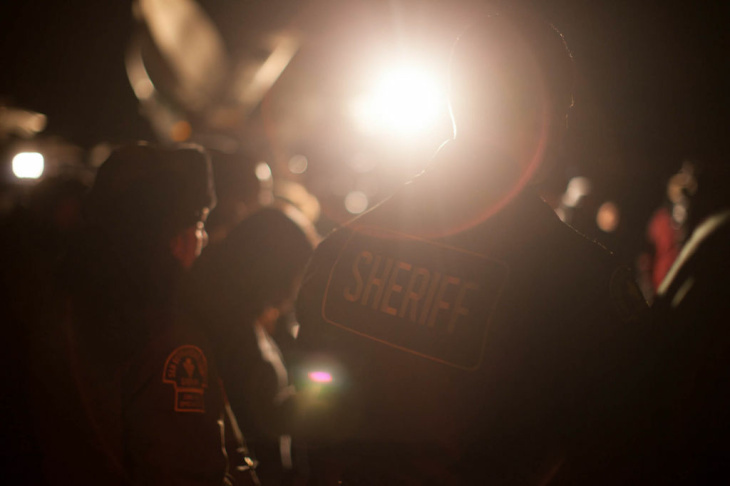 Sheriff’s spokeswoman Cindy Bachman says deputies are now deployed throughout the Big Bear area, on the lookout for Dorner. “The Sheriff’s Department has an aerial search going on as well as a ground search and a door-to-door search,” Bachman said. "There’ll be several hundred homes that will be — deputies and other law enforcement officers will make contact at those homes. And they are taking every precaution in case he’s may still be somewhere up here in the mountain area — and the search is underway. Dorner was driving that Nissan truck this morning when he exchanged gunfire with two LAPD officers in Corona. 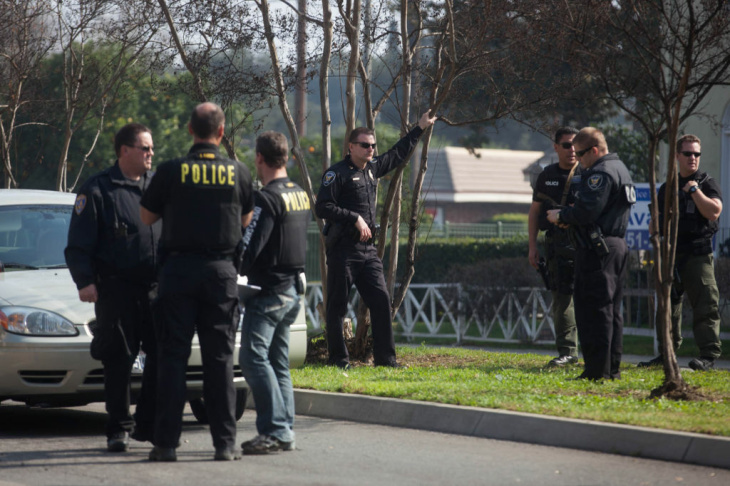 He then drove to Riverside where he shot and killed one police officer and wounded another. Dorner joined the Naval Reserve in 2002 and was promoted to Lieutenant in 2006. He left only days ago, and it’s unclear why. The Navy lists what it calls his “loss date” as February 1st of this year. He had served in San Diego and Nevada. Between 2004 and 2007, he also served with a unit at the Seal Beach Naval Weapons Station on its Mobile Inshore Undersea Warfare Unit 105. That unit protected harbors and adjacent land. Dorner was mostly involved in training others during his time with the Undersea Warfare Unit, said Gary Almeida, a retired Navy commodore who had Dorner and some 700 other personnel under his commmand. Almeida recognized Dorner from news accounts, but did not know him well because of the difference in their ranks, Almeida being a senior officer and Dorner lower-ranking officer. In 2006 and 2007, Dorner served a nine-month deployment. It began with four months in San Diego and then five months in the Middle East. He served in Bahrain to protect a civilian port and Kuwait to protect a port through which all the military gear was shipped to the war in Afghanistan. They also protected oil platforms off of Iraq, and the Marines who would travel through the port. UPDATE 5:11 p.m. 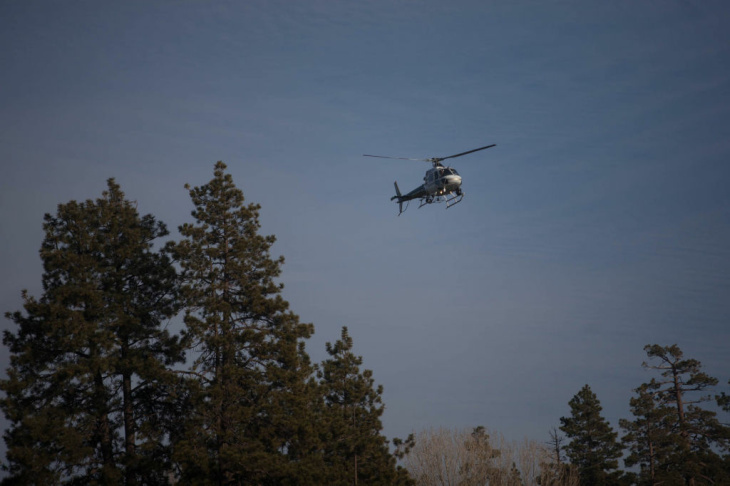 The Federal Aviation Administration ordered media helicopters Thursday afternoon to leave the area around Big Bear where authorities were searching for alleged cop killer Christopher Dorner, the L.A. Times reports. Law enforcement had expressed concern about helicopters showing officers' movements earlier, asking media not to show their "tactical movements." UPDATE 4:29 p.m.Los Angeles police are on tactical alert, Venice311 reports. UPDATE 4:00 p.m. Authorities in Big Bear spotted fresh tracks, which could belong to suspected cop killer Christopher Dorner, the Los Angeles Times reports, citing Big Bear Lake Fire Department Asst. Chief Mark Mills. In his self-described manifesto, Dorner claims to have access to handguns and other weapons, even a military shoulder-launched missile — and the knowledge to use them. Dorner’s former Naval Reserve commodore, Gary Almeida, said Dorner was indeed familiar with many types of weapons. 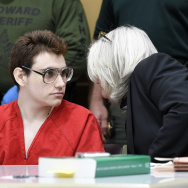 “He was trained in weapon handling, without a doubt 9 millimeter and M16 and shotgun, the military version of our shotguns, but whether he had cruiser weapon experience like the 50s or 60s or Mark 19, I’m not sure, but I’m almost positive he went through familiarization,” Almeida said. Almeida said Dorner served a deployment in Bahrain and Kuwait during 2006 and 2007, but did not experience combat. The burned out pickup truck found near Big Bear was confirmed to belong to suspected cop killer Christopher Dorner, San Bernardino County Sheriff John McMahon said at a press conference. There had been no reports of any vehicles being stolen from the resort, McMahon said. Police are going door to door searching for Dorner, McMahon said, checking each resident in the area. “Certainly, he could be anywhere at this point,” McMahon said, which he added is why the door-to-door searches are being conducted. There are also additional officers scheduled to patrol Big Bear around the clock; McMahon said there would be at least 15 to 20 additional officers. McMahon said they would keep working until they either locate the suspect or determine he’s no longer in the Big Bear Valley. Despite the additional security, there will be no curfew. Extra officers were stationed at the bottom of the hill to check vehicles coming up and down. Other officers have joined in the search from throughout the county, along with both state and federal authorities and deputies from other San Bernardino County stations. They also have law enforcement on the scene from L.A. and Riverside, as well as the FBI. There was no info indicating that shots were fired locally, McMahon said. He also said he wouldn’t reveal any information about the truck and what was in it when it was located, but said that it was in good enough condition to recover evidence from it. That area has lots of vacation homes, but McMahon said he didn’t know what percentage of the population is year-round. 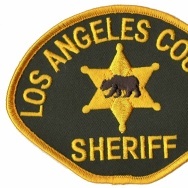 UPDATE 3:27 p.m. San Bernardino County sheriff’s Deputy Zach Beckum said the burned out pickup fire was being investigated, but there has been no sighting of Dorner, the AP reports. NBC L.A. reports that the vehicle fire was first reported about 8:30 a.m., citing Jodi Mille rof the San Bernardino County Sheriff’s Department. Miller said that department personnel, including SWAT officers, were dispatched as a precautionary measure. Dorner also sent a package to CNN anchor Anderson Cooper, Cooper tweeted Thursday afternoon. Learned today suspect Christopher Dorner sent me a parcel at CNN. Inside was a note, DVD, and a coin shot thru with bullet holes. UPDATE 3:11 p.m. Want to know more about ex-LAPD murder suspect Christopher Dorner, as well as the victims? Read our profiles. A Big Bear resort was shut down Thursday due to a search for ex-LAPD officer Christopher Dorner, suspected in a series of attacks on police. "We felt it was in the best interest of the search to close Bear Mountain for the rest of the day." said Chris Riddle, vice president of marketing at Big Bear Mountain Resorts. He also said they were in constant contact with authorities. 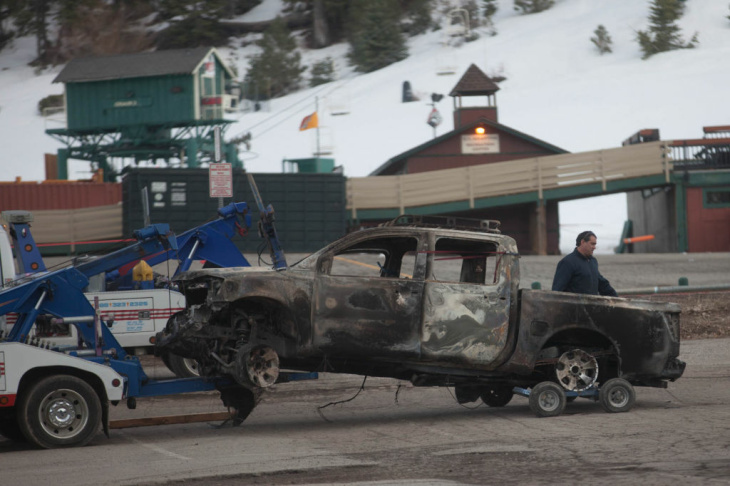 Multiple reports also indicate that a burned out vehicle, which resembled the description of Dorner's truck, was seen at Big Bear. KTLA, KCAL and ABC7 have reported that the vehicle is Dorner's. Police closed off a block and a half of Redbeam Avenue in Torrance where LAPD officers had fired shots at a blue pickup truck early Thursday morning. The truck looked similar to that of former LAPD officer Christopher Dorner, the suspect in the murders of an Irvine couple, and the shootings of three police officers in Riverside County. The truck was driven by two women believed to be delivering L.A. Times newspapers in the neighborhood. The gunshots fired by LAPD officers wounded one woman in the hand, and the other suffered two gunshot wounds but was in stable condition at a nearby hospital. Redbeam Avenue in Torrance is home to a lot of retirees in their 70s and 80s. John Bennett owns the home at 19402 Redbeam Avenue where the blue pickup truck was stopped during the incident. He’d been preparing to sell the house and received a text message from his real estate agent telling him to be careful if he went to the house because of reports of the shooting. Bennett said the neighborhood is normally very quiet. L.A. Police officers were stationed in the neighborhood on a protective detail for a police official named in Dorner’s manifesto. L.A. Police Chief Charlie Beck said of the shooting, “Tragically we believe this was a case of mistaken identity by the officers.” Beck said the pickup truck was driving with no headlights on. Bennett said neighbors told him that the newspaper delivery truck drove the neighborhood every morning with its lights turned off in order to not wake people up while they deliver the newspaper. Another police shooting incident occurred just around the corner from the first when Torrance police responded to reports of gunshots and saw another vehicle similar to Christopher Dorner’s. No injuries were reported in that incident. Riverside Mayor Rusty Bailey said the city would plan a proper memorial for the deceased officer. Bailey also acknowledged that the city of Riverside is a bit on edge right now, with residents wondering whether to send their kids to school, and officers patrolling with rifles and shotguns. Asked about the Torrance incident currently under investigation, where LAPD officers allegedly fired on cars they mistook for the suspect’s, Bailey said he’s aware that police officers may be on edge as well. “Heightened sensitivity also comes with some of those responses, so our chief and leadership have trained our officers and will continue to remind them to listen to their training, and their minds and their hearts, and to be certain of the actions and the decisions that they make as much as possible,” Bailey said. “I was in the military and we talk about the ‘fog of war,’ and that’s always a part of the situation when guns are involved. And so the leadership is doing everything it can to minimize those risks and to maximize safety in our city." UPDATE 1:30 p.m. 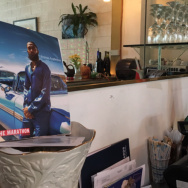 The second shooting connected with ex-LAPD officer Christopher Dorner in Torrance early Thursday morning occurred because Torrance police responded to a report of shots fired in the neighborhood. 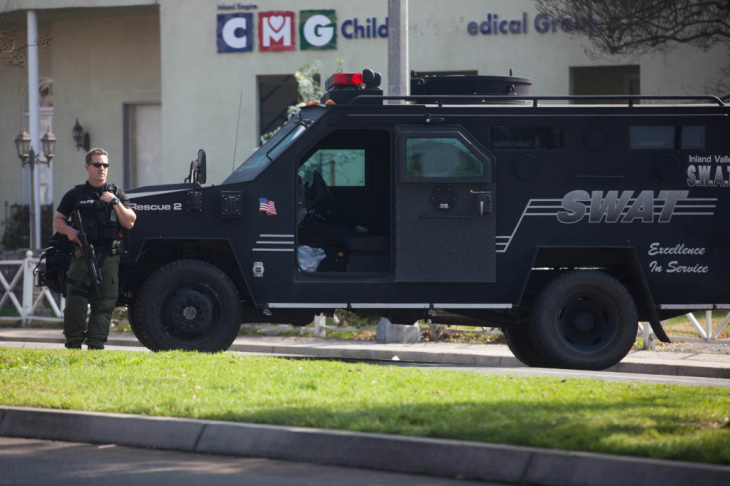 That turned out to be the Los Angeles police shooting at a truck delivering the L.A. Times. The Torrance officers then came upon another Nissan truck that matched the description of Dorner’s vehicle, and opened fire — but the driver wasn't Dorner. Fortunately, the police did not hit the occupant. Los Angeles mayor Antonio Villaraigosa was in Sacramento Thursday morning to support stronger gun control laws in California. He says LAPD chief Charlie Beck called him with an update on the manhunt for ex-officer Christopher Dorner. Villaraigosa said no grievance that Dorner may have with the LAPD justifies violence. Villaraigosa said he and other mayors are talking with state legislatures to urge them to act to reduce gun violence. Officials say they won’t release the name of the cop Dorner allegedly killed — or that of a second officer wounded early Thursday morning — until Dorner is caught. The department wants to protect the officers’ families. Riverside Police Chief Sergio Diaz did say the dead officer was 34 years old and a highly respected, 11-year veteran of the department. A multi-state manhunt is underway for Dorner, who is also a suspect in the double murder of a couple in Irvine. LAPD officers were chasing a suspect they believe was Christopher Dorner when they were fired upon in the city of Corona, law enforcement officials said Thursday morning. Police believe that Dorner then ambushed two Riverside police officers nearby, killing an 11-year veteran and wounding an officer in training. He is expected to survive. Riverside Police Chief Sergio Diaz declined to identify the officers because Dorner has said he will target the relatives of police officers. He said a “very wide net” has been cast in the manhunt for the suspect. “Law enforcement is using all of the tools at our disposal,” Diaz said. Dorner was first wanted in the killings of Monica Quan and her fiance, Keith Lawrence. They were found shot in their car at a parking structure at their condominium on Sunday night in Irvine, authorities said. Later, he apparently went to San Diego before he also became a suspect in the shootings in Riverside County on Thursday morning. About 1 a.m. Thursday, Two LAPD officers who were assigned to protect someone threatened by Dorner were told by a civilian thata man matching Dorner was seen in the area. The officers then began searching for Dorner and began following a truck that matched Dorner’s description. 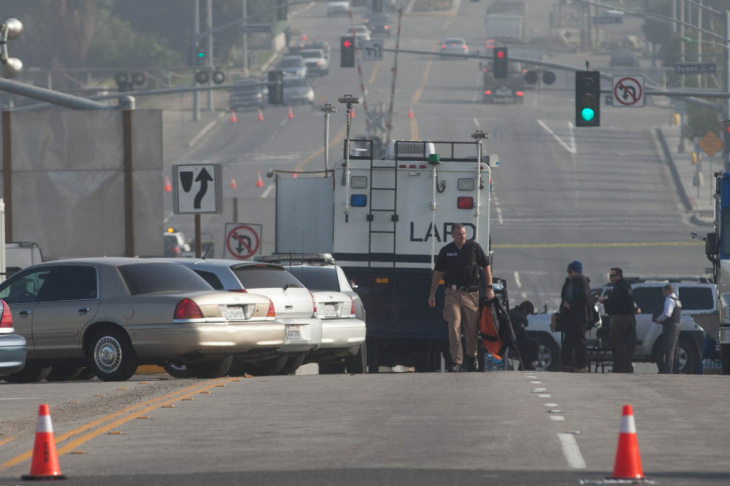 At the exit of Magnolia Avenue and northbound Interstate 15, it is believed Dorner fired upon the officers, who returned fire. One of them was grazed in the head and the patrol car was disabled. It is unknown if Dorner was hit. About 20 minutes later, two Riverside police officers – described as a 34-year-old veteran and a 27-year-old officer in training – were fired upon with a rifle by a man believed to be Dorner at the intersection of Magnolia and Arlington. A civilian who was nearby rendered aid, which Diaz credited with helping one of the officers survive. Police believe he has left the city of Riverside.